The cut of the picture is well chosen, allthough I think you could have left a little more room above the lips because the picture should actually show your work, thus the beautiful lips and this way their top end is nearly out of the photograph...but i think thats a matter of taste. The light is good, not too much shadows, not too much light but enough to see the blond hair shining in the backround. I like the idea of splitting the lips into 4 parts. This makes it a challange to match the colours, which you managed well, especially on the upper lip, where pink and red comes togheter but they don´t bother each other. I also like the way you did the border between the ceshire cat- and the heart qeen part on the upper lip. This kind of gives the appearence, that you can see only the cats tail and there is more of it somewhere under the red colour. but again the frames are clear and clean. On the whole I think this is a wonderful work of a very talented artis. I love your technique with makeup! Since Alice in Wonderland is a twisted story, I love the many designs, the drink me tag really stands out. All the effort makes it even more spontaneous. I do believe you can make lots of money from this. I do believe you did a fine job and I never seen anything like it in my life. It is beautifully bold and I'd love to see more from you. The bright colors and the darker colors makes an amazing contrast. The white and black make it seem like a magical piece of art. Once again, good job and I'd love to see more! Wow!!! That will be nice to see!!! Send me a photo!!! did you hear me. *cartoon version of ear checking* i said a sluttier version. I love how you represented different elements of the movie. And the Drink Me tag is pure genius! Excellent job! 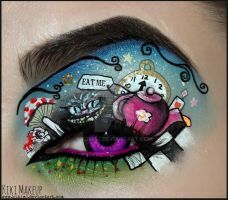 I love this so much OuO alice in wonderland is my favoirte movie of all times and this is just wow amazing soooo amazing! Love, love, love this one too , I'm almost done I swear! This is amazing. Alice in wonderland is one of my favorite books of all time! Alice in Wonderland is my absolute favourite story, This is super unique and very nice indeed! This is so wonderful!!! I'm having an Alice in Wonderland wedding in 2014, and this just gives me loads of inspiration! Could you do one with just the red with black hearts lips? Maybe like, a tutorial video? This is beyond Epic. I LUV IT! i luv dat sooooooooooooooooooo much can u do more?? Very interesting. Love the colors and designs. Love this one! The "drink me" tag looks wonderful.